[August 18, 2015] Steam Contest Giveaway! Check out the Contest Page for details! [Feb 2, 2015] Just finished the last of the revisions to Artifice: Episode Four! My editor’s gonna’ have one last look at it, then off to publishing! [Jan 8, 2015] Good news! I’ve literally got five pages left to write for Episode Four! In a few days, I’ll be sending it off to the Beta Readers and my Editor! Expect it soon! [Dec 4, 2014] Only one way to say this, and it’s not pretty. 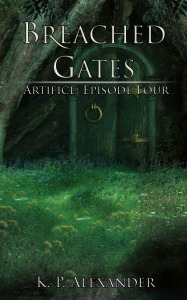 Artifice: Episode Four (Breached Gates) won’t be published until the beginning of January. More details in this post here. [Dec 3,2014] The more astute among you may have noticed the new layout of the site. Some of the graphics are just placeholders for now, but will be updated soon(ish)!